An initial report detailed the origins of iOS in the Car and how Apple says it will work, while a second examined the competition Apple faces in automotive and why it's pushing so hard for an immediate launch next year. A weekend editorial further outlined the strategic importance of Apple's iOS in the Car. In a public announcement quite rare for Apple, Eddy Cue, Apple's senior vice president of Internet Software and Services, the group that manages iTunes, iCloud, the App Store, iMessages, Siri and Maps, outlined iOS in the Car as a major new initiative for the company, one that's set for launch next year. After reviewing the new features of Siri slated to appear in mobile devices running iOS 7 this fall (below), Cue segued into automotive, noting, "Siri is also a big part of our next feature, 'iOS in the Car.'" Cue set the subjunctive mood with the logic, "95 percent of cars sold today have integrated music playback and control from an iOS device. But we want to take this integration to a whole 'nother level. 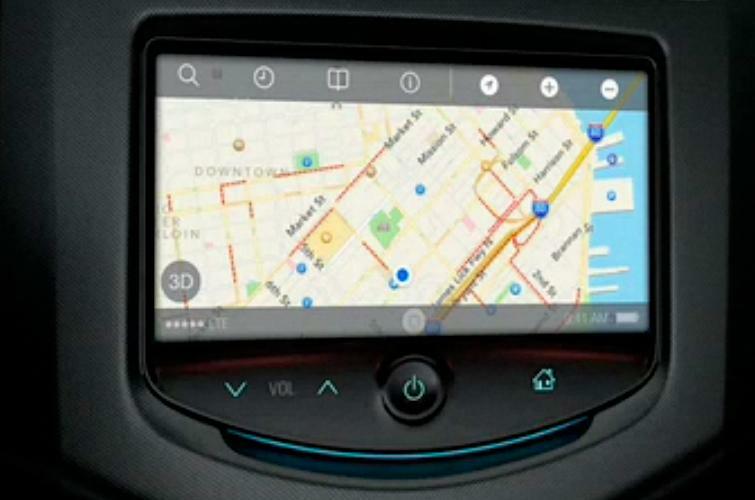 What if you could get iOS on the screen that is built into your car?" 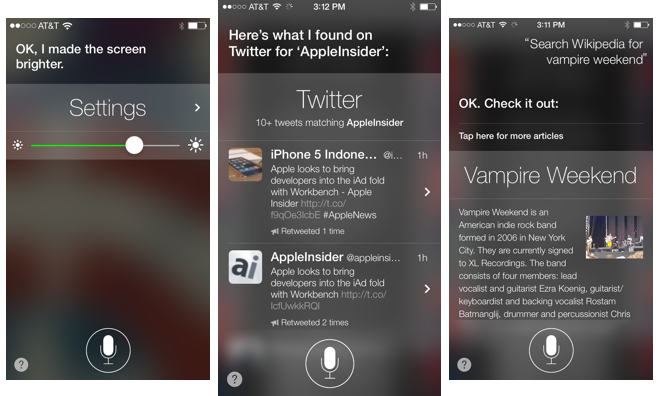 He then quickly demonstrated a series of features for the new interface, jumping from a Siri-assisted hands free calling screen to set up a call (below), to audio playback (including support for "third-party audio apps"), to Maps with traffic and 3D turn-by-turn directions, to iMessage integration for listening to incoming messages and dictating a reply Eyes Free. Cue's demo, as well as the images Apple uses to portray iOS in the Car on its iOS 7 preview website, framed the new interface in a car dashboard equipped with a large power button and LED illuminated volume controls as well as a Home button with the icon of a house, all together a very non-Apple looking setup (below). The "House" button seems particularly off because the iOS in the Car screens feature their own software Home button, which is itself a new thing for Apple. 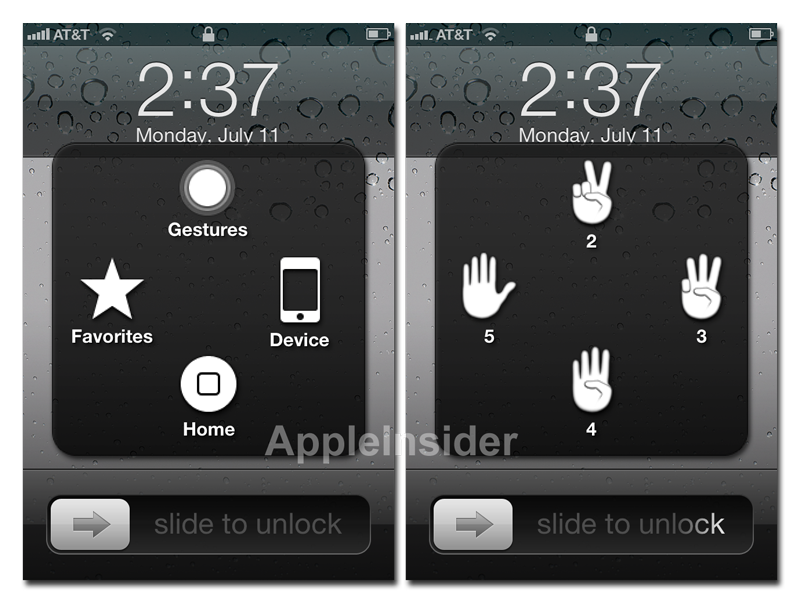 All existing iOS devices have always supplied a single hardware Home button, and no iOS screen presents a software alternative apart from the special Assistive Touch accessibility mode first introduced in iOS 5 (below). It seems like iOS users would likely be confused by two buttons, both in close proximity and which work nothing like their iPhone or iPad; the physical power button would appear to turn the screen off, and is much more prominent than the actual, but virtual, Home button above it. If you drag images off of Apple's iOS 7 preview webpage, you can see that Apple's user interface is actually being framed by a separate graphical layer of the dashboard: the images are not photos of a real car interior, they are compositions. On its iOS 7 preview site, Apple also obscures the button bar depicted at the top of the screen in its WWDC demo video; the equivalent Maps image Apple has on its preview website covers up the buttons with a large incoming message notification (below). At first glance, these oddities suggest that Cue's demo was simply an early stage mockup of what Apple plans to get finished soon, a conceptual interface of an early work in progress. Apple's odd dashboard arrangement is explained by the fact that the company simply used an existing screen, bezel and dash design already in use by General Motors. 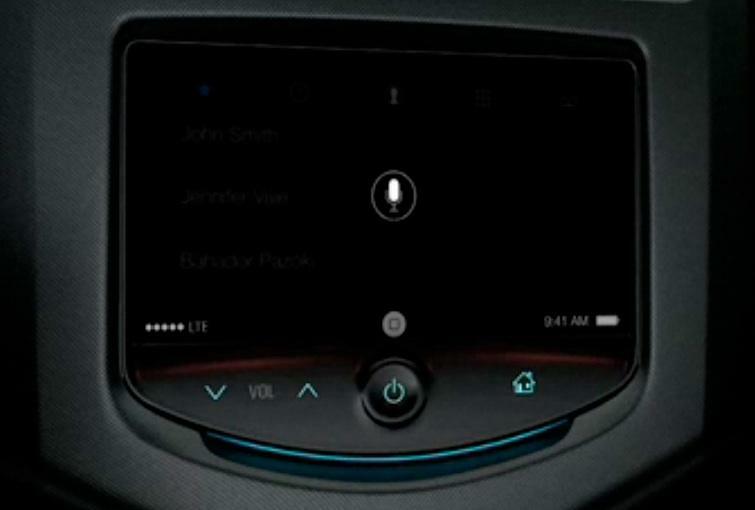 The screen and its frame is pulled directly from a 2014 Chevy Spark, which features those same buttons on an interface that appears to have been designed for your grandfather in the 1990s. 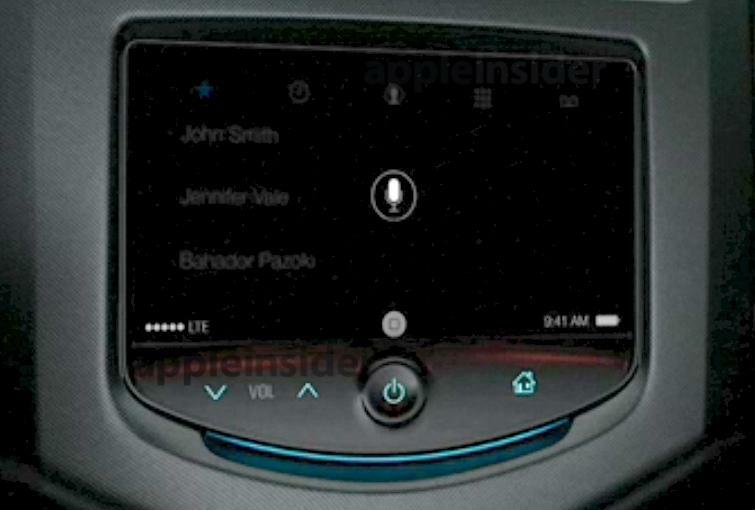 Apple simply superimposed its iOS in the Car interface on top of the existing car layout of a company that it's already working with as a partner, one that's so confident in Apple's products that it recently released an ad for its new Chevy Sonic that focuses almost entirely upon the vehicle's Eyes Free integration with Siri running on "your iPhone." However, there's compelling evidence that Cue's demonstration wasn't simply a series of mocked up graphics that anyone with a basic graphics editor could put together: there was more to be revealed in Apple's public demo. If you freeze the video at the beginning, where Cue introduced Siri listening for the next command, you can see a strange, subtle artifact at the top of the screen. If you process and enhance the video, an entirely new screen that Apple has never revealed in public appears: the Contacts page associated with selecting what appear to be Favorites, Recents, all Contacts, a dialing Keypad, and a harder to make out icon that appears to be Voicemail. These details were actually presented on stage and captured in the video, but were latently hiding in the dark shadows of the histogram that nobody in the crowd of thousands sitting there in audience could actually see. It was literally right in front of their eyes, yet still invisible. It's actually easy to guess the functionality of these icons because they are identical to those Apple has revealed in its sneak peek of iOS 7 (below). If the interface for iOS in the Car were simply a conceptual mockup, it wouldn't make much sense to have developed a functional user interface screen that isn't even visible in the demonstration. Apple simply had more available to show than it intended to. The first vehicles equipped with iOS in the Car are set to become available in 2014, from car makers including Honda/Acura, Mercedes-Benz, Nissan/Infiniti, Ferrari, Chevrolet/Opel, Kia, Hyundai, Volvo and Jaguar. An initial report detailed the origins of iOS in the Car and how Apple says it will work, while a second examined the competition Apple faces in automotive and why it's pushing so hard for an immediate launch next year. 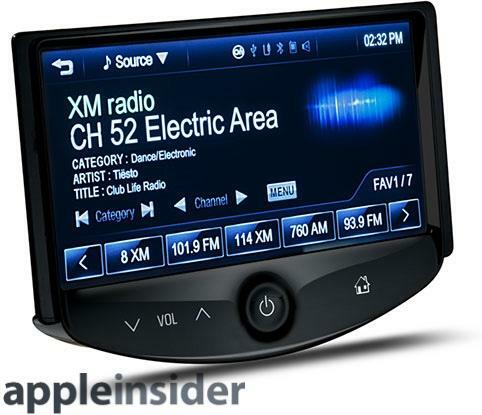 An editorial further outlined the strategic importance of Apple's iOS in the Car.